fttb Archives - jxeeno™ blog. The company building the National Broadband Network, nbn, has released details how it proposes to classify premises where “remediation is required”. 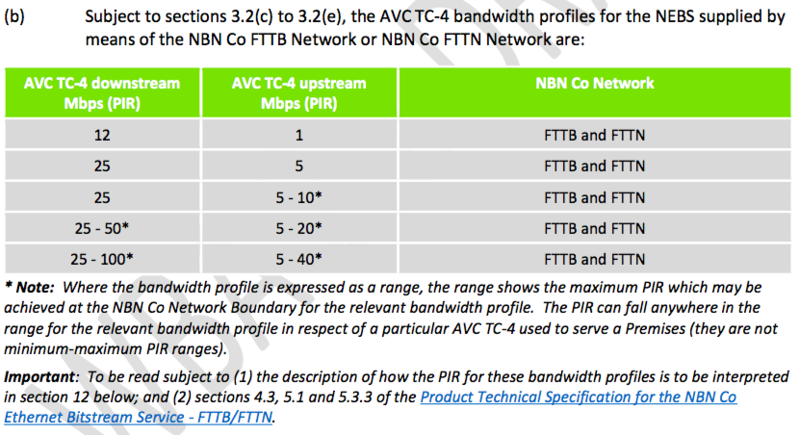 In the most recent draft of the Wholesale Broadband Agreement (WBA 2.2) released Access Seekers for FTTN Business Readiness Testing, nbn revealed that “NBN Co will designate that Remediation is required” where “25 Mbps downstream and 5 Mbps upstream for all bandwidth profiles other than 12 Mbps downstream and 1 Mbps upstream”. The company also included an exception clause for the Fibre to the Node network where the speed is limited to 12/1 Mbps during the co-existence “transition” period. While a premises is being designated for remediation, nbn™ says that speeds may be “significantly less than” the speeds ordered by the customer. 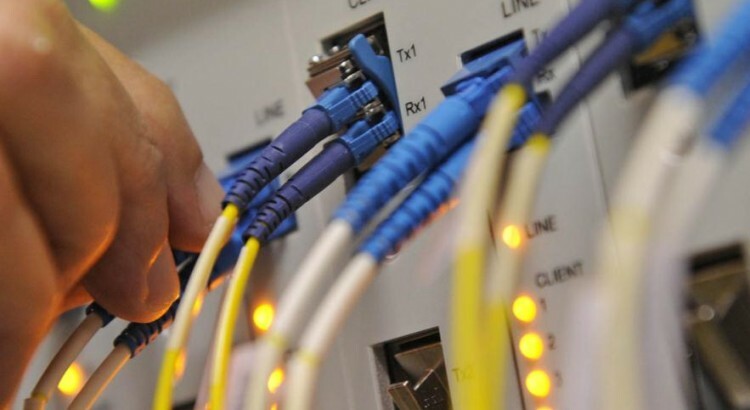 The company has also revealed for ranging speed tiers such as those used for the Fibre to the Node and Fibre to the Basement products, the performance criteria for the Peak Information Rate (PIR) may only be reached the specified range “once” within a 24 hour period. 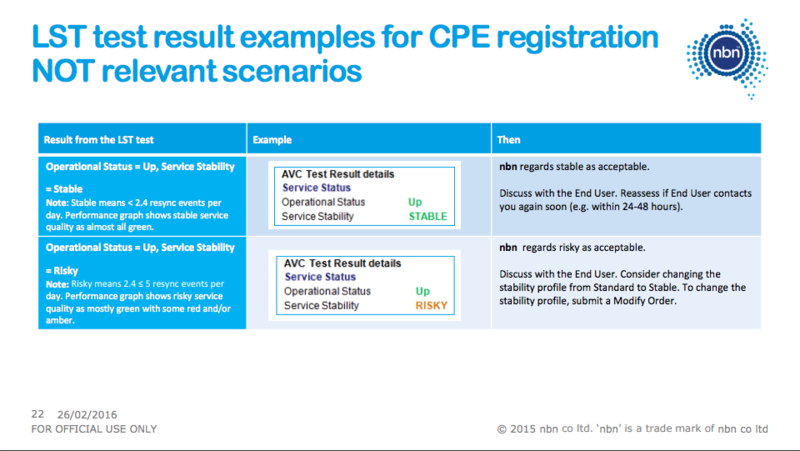 However, this performance guarantee applies only applies to the network that nbn™ provides to the service providers. 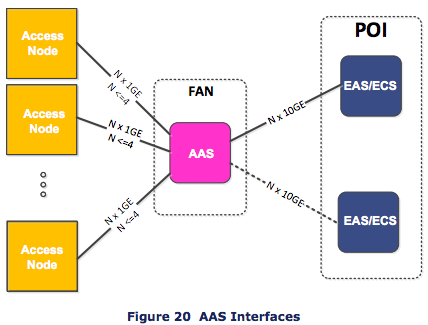 Additional factors such as service contention set by service provider may further degrade services received by the end user. While legacy services such as ADSL2+ exist on the Telstra copper network, speeds will be limited to reduce interference. Despite what the documentations says, nbn™ has now denied (on the record) that they will “limit” speeds to 12/1. Please refer to this post here for more information. In the most recent draft of the Wholesale Broadband Agreement (WBA 2.2) released Access Seekers for FTTN Business Readiness Testing, nbn has revealed that speeds will be limited to 12/1 Mbps during the so-called “Co-existence Period” on the Fibre to the Node network. During this period, all bandwidth profiles will be restricted to reduce interference with existing legacy services that run on the Telstra network. A similar limitation will apply to Fibre to the Basement, however, the maximum speed will be limited to 25/5 Mbps rather than 12/1 Mbps. 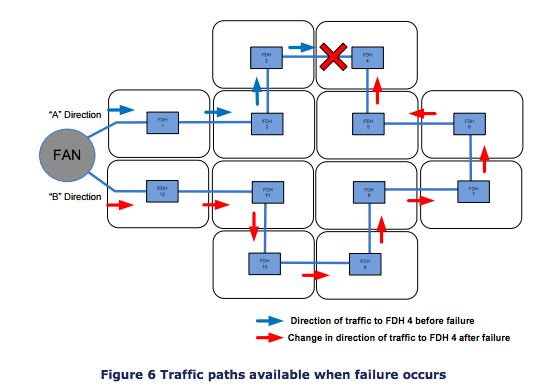 NBN Co will disable Downstream Power Back-off in respect of an NBN Co Node when NBN Co is satisfied that Downstream Power Back-off is no longer required in respect of that part of the NBN Co FTTB Network or NBN Co FTTN Network (as the case may be). The Co-existence Period for Ordered Products supplied by means of that NBN Co Node will cease at such time. Despite explicit wording of the documentation, however, a spokesperson for nbn™ has denied to technology publication ZDNet that they will limit speeds. Instead, they have indicated that they will guarantee speeds of at least 12/1 mbps. 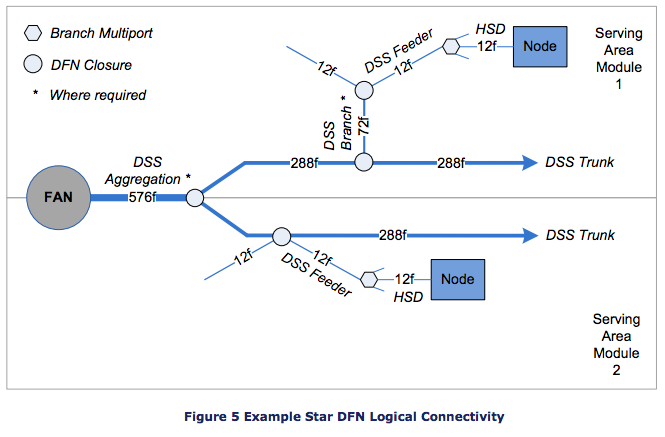 For customers who live close to the exchange, the speed attainable over the Fibre to the Node network may actually be lower during the “Co-existence period” than what’s possible over their existing ADSL2+ service. The typical theoretical maximum speed for ADSL2+ is 24/1 Mbps and is delivered from the Telstra exchange. However, since the duration of the Co-existence period varies depending in the area still using ADSL or special services – customers who experience greater speeds over ADSL2+ (greater than the 12/1 Mbps offered) would still need to migrate to NBN before NBN Co can declare the “Co-existence period” over. Once the Co-existence Period is over, nbn™ will provide 12/1 Mbps and 25/5 Mbps speed profiles similar to those on Fibre to the Premises with higher speeds only available as an “up-to” range. 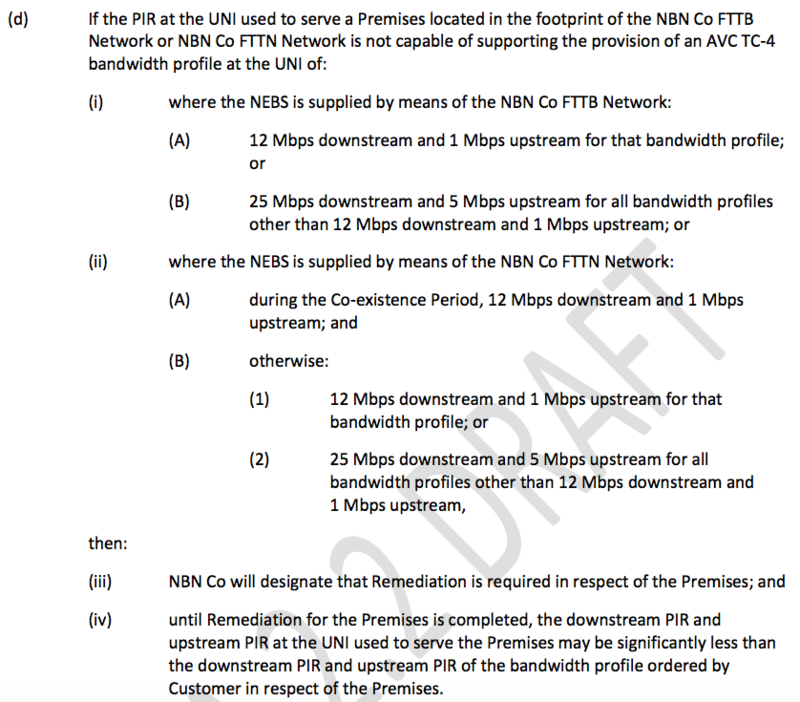 However, NBN Co also states in the document that it is considered acceptable if the customer only receives speeds set out in the PIR or PIR range “once” in 24 hours. 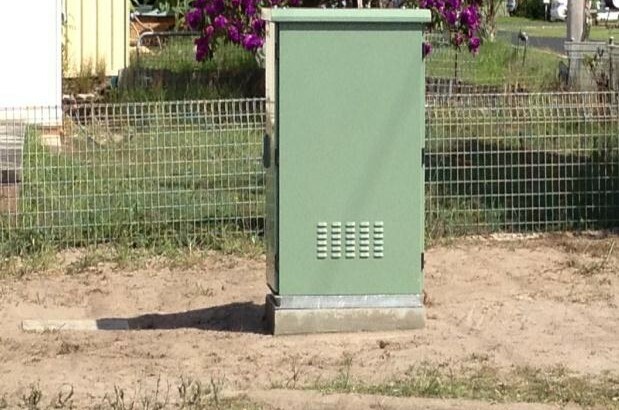 NBN Co is set to give consumers more choice over the technology being rolled out. 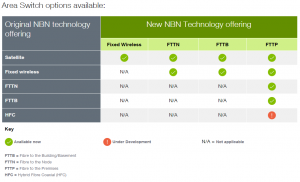 They have released their new Technology Choice Policy which will allow individuals or whole areas to switch from NBN Co’s designated technology under the Multi-Technology Mix model to an alternative technology type at a cost to the consumer. This is a much anticipated component of the revised rollout policy after NBN Co’s switch to the Multi-Technology Mix — allowing consumers to purchase a “fibre-on-demand” product. However, there are no details or estimates on the expected cost of upgrade build. 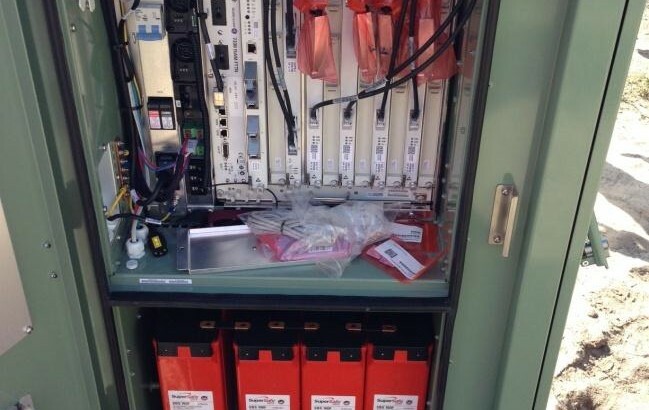 As part of the application and network design process, NBN Co will charge individuals $600 (ex GST), and at least $1,000 (ex GST) for a quote to network switch over a large area. 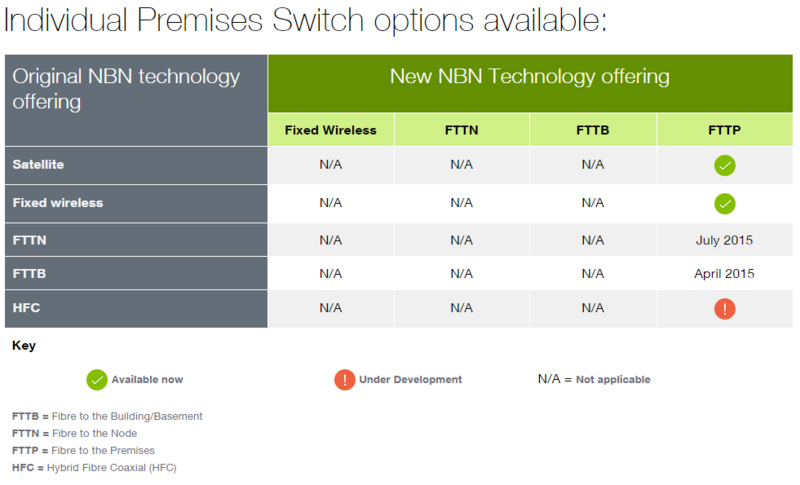 According to the NBN Co website, the final costs for each the different technology upgrade “can range from a few thousand dollars to tens of thousands of dollars” for an individual premises switch and “can range from tens of thousands of dollars to several millions of dollars” for a switch of an entire service area. 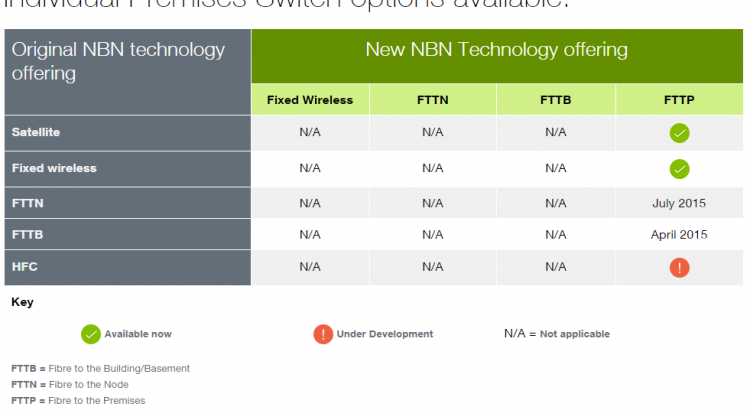 While absent from the actual policy document, NBN Co’s Chief Customer Officer John Simon indicated to ZDNet’s Josh Taylor that the fee for the application will be refunded if the extension goes ahead. 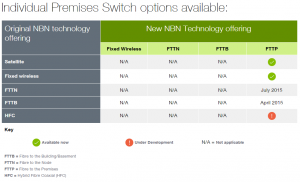 At launch, NBN Co will allow applications to switch an entire area from FTTB, FTTN, Fixed Wireless or Satellite to a full fibre network (FTTP). Starting April, individuals be able to make an application to switch from FTTB to FTTP; and following from that, the switch from FTTN to FTTP will be available in July 2015. However, the possibility of a HFC to FTTP upgrade is still being considered and developed by NBN Co. 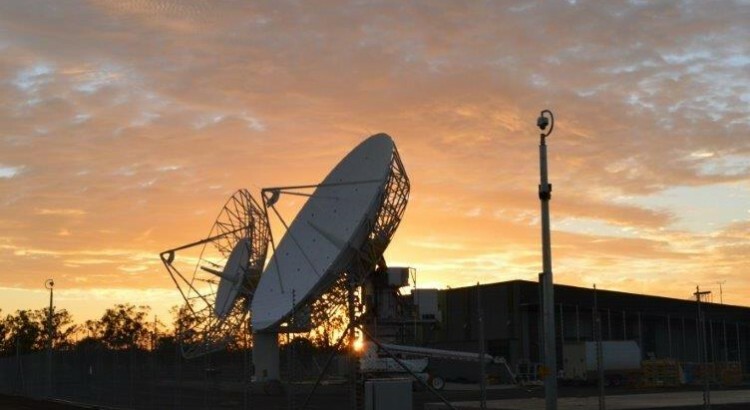 The new policy, released this week on Friday*, replaces the existing Network Extension Program which enabled individuals or communities who were slated for Fixed Wireless or Satellite to upgrade to Fibre to the Premises or Fixed Wireless (respectively).